The Pure Strength Omega 3 provides 800mg of EPA and 400mg of DHA in easy-to-swallow capsules from MSC certified, sustainable Alaskan Pollock. EPA and DHA contribute to the normal maintenance of normal brain function and normal vision (beneficial effect obtained with a daily intake of 250mg DHA) and the normal function of the heart (beneficial effect obtained with a daily intake of 250mg DHA/EPA). Fish Oil Concentrate (Fish), capsule shell (Gelatin [Fish], Glycerol), Antioxidant (Mixed tocopherols). 4 capsules per day with or without food. This product contains fish derivatives and therefore should not be taken by people with allergies to fish or on anti-thrombotic drugs. 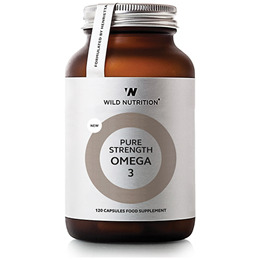 Below are reviews of Wild Nutrition Pure Strength Omega 3 - 120 Capsules by bodykind customers. If you have tried this product we'd love to hear what you think so please leave a review.